Yamaha India has introduced new and revised colour options for its top-of-the-line scooter, the Yamaha Fascino. In addition to revamping its entire colour pallet, Yamaha has also introduced a brand new colour option, called the Glamorous Gold. What you also get is updated body styling and graphics which complement the colour schemes. A redesigned chrome insert on the front apron, chrome rearview mirrors and the new Fascino badging on the fender add to its charm. Yamaha is offering all this at no extra charge, which means the Fascino stills retails at Rs 54,593 (ex-showroom Delhi). Other changes include new dual-tone seat covers and a slightly raised grab rail for better pillion comfort. Taking into account the new paint schemes, the Yamaha Fascino will now be offered in a total of seven colour options - Glamorous Gold, Dapper Blue, Beaming Blue, Dazzling Grey, Sizzling Cyan, Spotlight White and Sassy Cyan. All shades, except for Sassy Cyan, have been updated, while the Fascino’s Fusion Red has been discontinued. Mechanically, the scooter remains unchanged. It’s still powered by a 113cc single-cylinder, air-cooled engine that produces a 7PS of power and 8.1Nm of peak torque. The variomatic transmission takes care of seamless automatic gear changes. 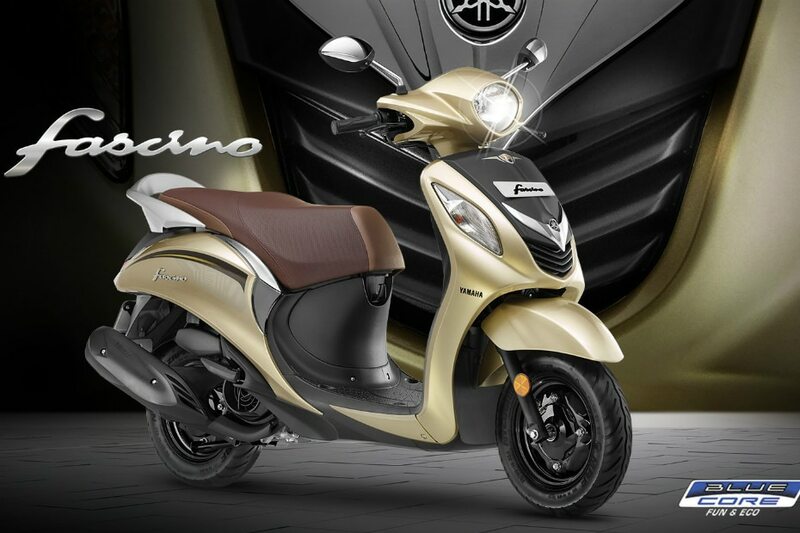 The Fascino employs an underbone type chassis with conventional telescopic forks up front and a single shock absorber at the rear. Braking duties are handled by drum brakes at both ends while both the wheels are shod with 90/100 tyres.